One of the most common causes of business failure is inadequate financing. But, let’s be honest, sending out invoices, keeping track of expenses, doing the weekly payroll and filing taxes can be incredibly challenging when your mind is on business growth. No matter how vital these tasks, they are tedious and can consume more of your time and resources than you would like. With the following bookkeeping apps, however, you streamline all of your finance tasks so that you can ensure that your business succeeds. 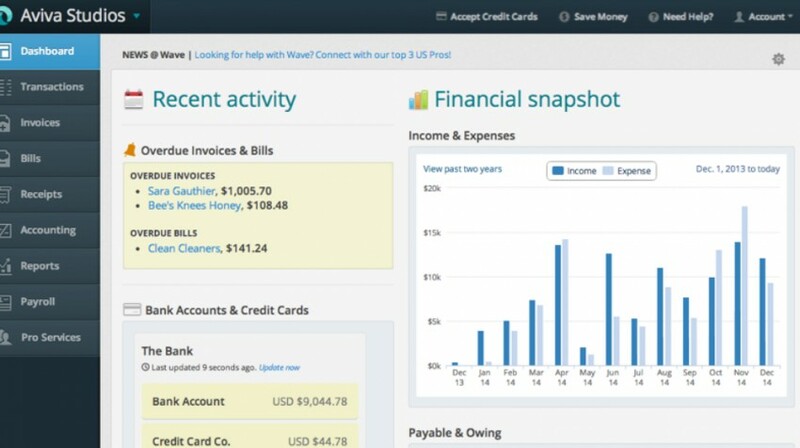 Since launching in 2010, Wave has been used by more than 2 million small business owners, consultants and freelancers to manage all of their accounting, payroll and invoicing needs. Wave also has a handy receipt scanner and is 100 percent free. And, if you do run into any serious problems, Wave can connect you to a local accountant through it’s ‘Find an Account’ feature. With the Wave iOS app, you can easily send out an unlimited number of invoices while on the go. As for Android users, the Receipts by Wave app allows you to scan receipts and upload them to the cloud to simplify your business’s record keeping. Forbes has stated that FreshBooks is “incredibly user friendly,” and there’s a whole lot of truth to that. The FreshBooks platform gives you the power to create online invoices, capture expenses, track your times on a job, and keep a tab on your cash flow and expenses. If that isn’t enough, FreshBooks comes with award-winning customer support. The FreshBooks app is free and handles all of the tasks that were just mentioned. One of the best features about the app is that you can work offline and all your information will be synced to the cloud once you’re back online. If you’re looking for a top-notch time tracking and invoicing platform for your business, then Due.com is worth checking out. You can create professional-looking invoices in a snap and manage times by either client, project, or task. What makes Due.com stand out from other time tracking and invoicing tools is it’s design. It’s well-organized and has brightly colored icons so that you can easily view the progress of your work. The app is free for five clients per month. If you want to integrate with PayPal, set-up recurring payments, and send out unlimited invoices, pricing starts at $3 per month. YNAB was named the 2011 Reader’s Choice Winner for Best Personal Finance Software by About.com because of how efficient it is at helping you make informed spending decisions. With YNAB you can quickly view your budget’s ‘outflow,’ schedule bills and paychecks, and split transactions. YNAB supports most currencies (Dollars, Euros, Pounds, Rupees, Reals, Rands) and has a convenient autosave. You can download the YNAB app for iOS and Android devices for a free trial. You will have to purchase the software with a one-time payment of $60 following the free trial. If you find payroll and taxes a bit too tedious, then Zenpayroll is one of the best solutions available. Zenpayroll will automate everything from new employee reports, calculate state and federal payroll taxes, and process payroll. You can even use Zenpayroll to track employee sick and vacation time, set up worker’s compensation, and create online payroll forms. To access Zenpayroll on any device, you’ll have to pay a monthly fee of $25 plus $4 per employees. Keep on top of the coupons and cash back deals on the products and goods that your business commonly uses to save 3 to 10 percent utilizing the Ebates app. If your small business or startup purchases supplies from Amazon, for example, the Ebates.com app can notify you or your buyer when discounts are available. As a business owner, there will be plenty of employee expenses that come across your desk. Thankfully, Expensify has developed software that will simplify how expenses are reported and approved. With Expensify, you can capture billable expenses, add cash expenses, scan receipts, and automate duplicate expenses with ease. There’s a free mobile app for iOS, Android, BlackBerry, and Windows Phone devices. Neat is a nifty tool if you’re looking to improve your workflow. This is accomplished by letting you file receipts and invoices in seconds and create tax, spending, and expense reports. And, if you need to pull up a previous invoice or receipt, you can do so in one convenient location. The app can be used on Android and iOS devices, but you’ll have to purchase the Neat Cloud Service. Plans range from $5.99 to $24.99 per month. What can’t Zoho do for your business? The platform can be used for sales and marketing, email collaboration with team members, recruiting, invoicing and expense reporting. Zoho also seamlessly integrates with Google Apps and is an affordable option with plans starting at $12 per user per month. If you need to manage your business’s finances while on the go, Zoho is available for iOS and Android users. There’s even an app for the brand new Apple Watch! Which bookkeeping apps do you frequently use to handle your finances? Next Next post: Why is credit card usage on the rise?